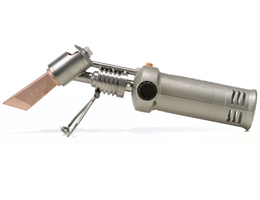 The portable soldering iron is used for sheet metal work and is made of high quality Titanium and aluminium. The handle is ergonomically designed for greater comfort and includes automatic piezo ignition. The burner incorporates an effective windshield that encases the flame and reduces the risk of burning sensitive material. The precision valve in the handle makes it easy to obtain the right heat for the copper soldering bit.